I saw this mirror in my favorite consignment shop as I was reconciling my account and on my way out the door several weeks ago. I really liked the shape of it and the detailing in the edges, but I ended up leaving without it. Mistake... When I got home, I had all kinds of ideas for it and knew all it needed was a can of spray paint to revive it. So, a couple of days later, I headed back to Twice as Nice and brought it home. I wasn't sure what the best spray paint would be for the job - I did know I wanted it gold. Dimples and Tangles is one of the blogs I like to keep up with, and Jennifer is the queen of redoing things she finds on Craig's List and even, literally, the side of the road. I emailed her and she suggested using Rustoleum Metallic Gold. There was just enough room between the mirror and the frame to tuck some paper under the edges, so I didn't have to tape it off. This is the paint I tried first, but this was more of a matte finish. I wanted it to have a shiny, brassy look, so I ended up using Valspar's Metallic Gold. It gave the mirror the look I was going for. Spray paint is your friend and usually around $5-$7 a can. 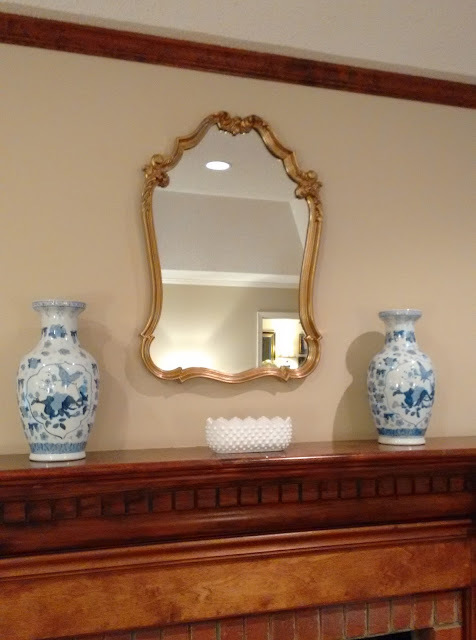 Not sure how the mantel will end up being styled, but blue and white will be up there somewhere.